Short term volunteers (age 16 and up) are needed to assist with various projects at our office located in Little Falls, MN. Volunteering at Habitat is a unique experience that enables you to develop your skills in different areas. Volunteers play an integral role in every aspect of the ministry from administration to construction. All volunteer applications are carefully screened to offer you the best volunteer experience possible. If your skills match an opportunity, we will contact you to find out more about your suitability to volunteer, and to discuss where you would best fit. 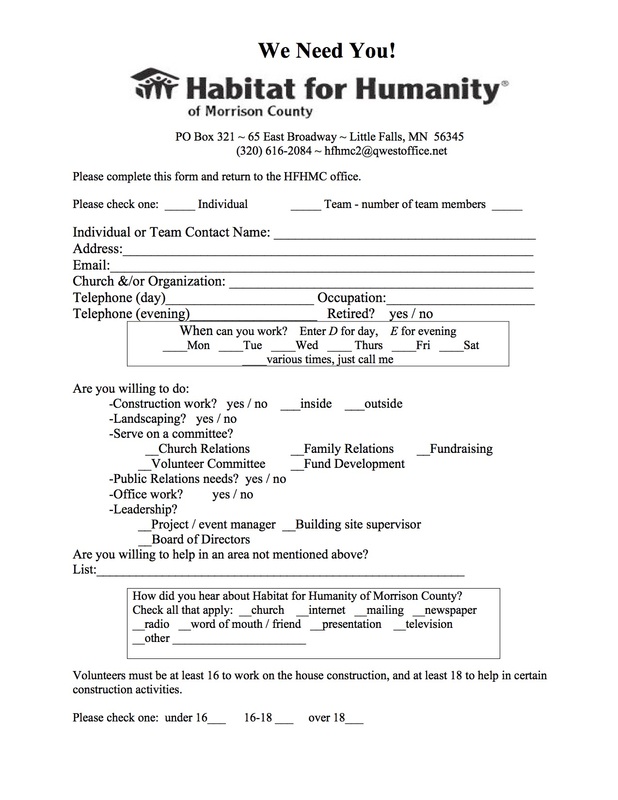 For any questions regarding the Volunteer program at Habitat for Humanity Morrison County, please contact the us at: hfhmc2@qwestoffice.net or (320) 616-2084. Make your 2-3 week vacation meaningful with Habitat--exploring new lands and cultures while building houses and hope. Participate in a Global Village work trip! Spend three to 24 months living and working abroad! A variety of volunteer positions are available, on and off the construction site. Earn stipends and educational awards by serving communities through these Corporation for National Service partnerships. RV travel just got better! Habitat for Humanity International’s RV Care-A-Vanner program offers anyone who travels in a recreational vehicle the opportunity to make a difference — and have fun while doing it — by helping build houses with families in need.